Effective January 16, 2019, the BlackBerry Smartphone Fan League will officially be shutting down. Keep an eye on CrackBerry.com and our BlackBerry Mobile social accounts for more great engagement in 2019! You have shown us how passionate you are about BlackBerry-branded smartphones through your posts, photos and content sharing around KEYone, Motion, KEY2 and KEY2 LE. We appreciate each and every interaction we’ve shared and look forward to creating even more opportunities to reward our passionate BlackBerry smartphone fans. Let us know what new types of campaigns and activities you’d like to see from us in this thread! RK_BB, Bla1ze, Rico4you and 2 others like this. BlackBerry Mobile and Sigewif like this. Be interesting to know how those here like the program.... did those point equal a free phone or a big discount on a new phone? I liked the program, it will be missed. If BBMo started up their own hashtag (similar to #ShotOnBlackBerry ) for pictures shot on a BBMo device, engagement will continue to grow. Perhaps splitting pictures into 2 distinct streams, #ShotOnKEY2 and.... #ShotOfKEY2 (where you take a picture of your phone in a unique or picturesque setting). Finalists could be rounded up on a monthly basis for a CrackBerry poll or something...just an idea. Keep the momentum goin, right! I enjoyed the program. It upped my social media activity from 0 to posting a daily picture on Instagram. Now that it is over, I will be dropping down to a weekly post to let people know that Blackberry phones are still around. Must admit it was great seeing the social media actively promoting BlackBerry devices..I would like to see active trade in programme that is based on social media interaction. Looking forward to next promos! the brother and Sigewif like this. Do you want something wintery? Or are you missing summer? Nothing wintery, I'm too Canadian to care about winter at this moment. Bbnivende and Rico4you like this. It was fun. I won a super cool backpack, an aluminum water bottle and a leather mouse pad. the brother, BlackBerry Mobile and PantherBlitz like this. I enjoyed this campaign. I won a very cool and useful BB branded backpack, and also a thermos and mouse pad close to the beginning. 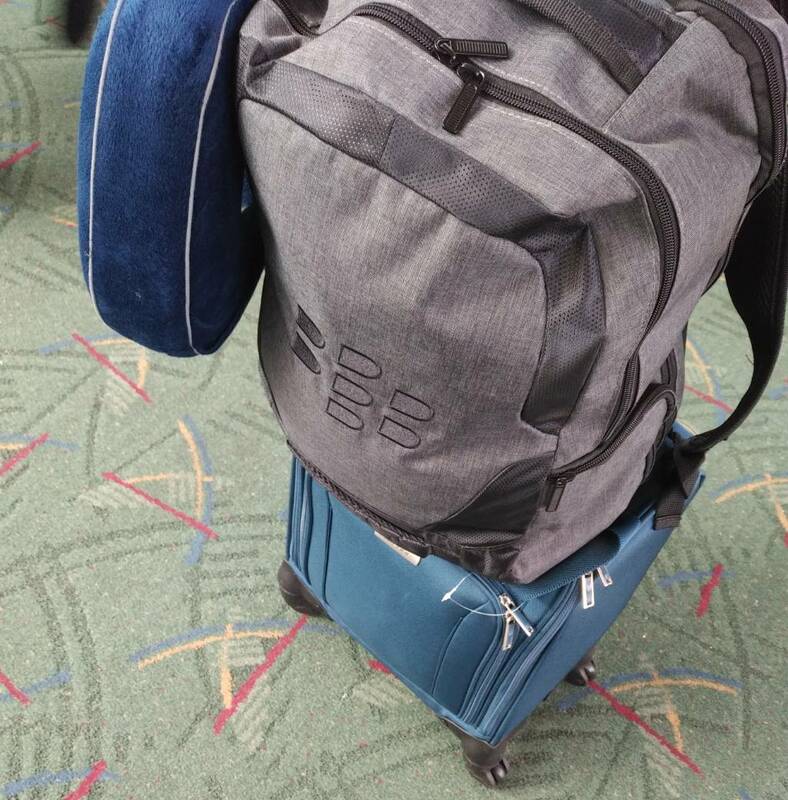 The backpack has been on 2 trips so far: one cross country and one international to Europe , as a carry on. (See photo :-). No one came up to me and said anything but it has been through a few major airports. I thought if there was anyone from TeamBlackBerry who saw it they just might make a comment. I am glad I came across this message here on CB. I was posting a photo, Jan 15, an hour or so before the daily cut off time, and then went to look whether it had registered: Surprise--everything was gone with a memo that it ended. I even wrote their help desk. Didn't think to look here for an announcement. I ranked high on the chart before it all disappeared, (such is life--here and then gone... :-) but I didn't get a screen shot. Lol. Just before New Years I got a message that I had won some swag again (different items :-) and am looking forward to its arrival. Thanks! and yes I am game for another campaign. Rico4you and G_Unit MVP like this. I do social media, but had no idea either that this fan forum existed. Wish I had, though. Aww man, I was hoping I could join but I didn't have Facebook or Twitter. I only have LinkedIn & Instagram. Still great that the program ran for so long. I was on at the beginning and got a few badges but never won anything and became too much of a hassle for me. Figured I had slim chances to win anything and just stopped. Glad to hear that some of you guys won something.